With the snow almost completely melted, the minigolf courses in Canada now been opened for about 4 weeks so it's time to slowly get back to competition. 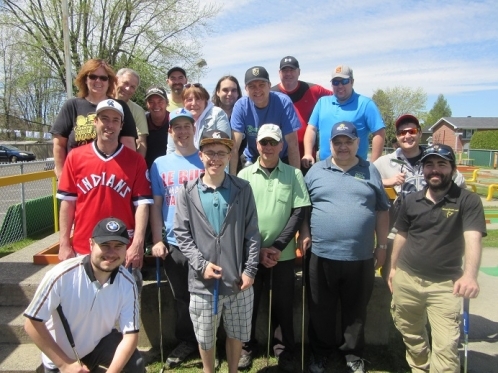 The tournament season started with the first preseason day on May 5th at Mini-Putt Terrebonne just north of the city of Montreal where 2 team tournaments on the Mini course (purple colour) were on the schedule. Thirteen players showed up on a somewhat chilly (7�C) Saturday morning. This practice was more than welcomed as new carpets were recently installed on this course and players had to revise all their spots and speeds as the new ones are slower. The format of a pro-am tournament relies on a formula created in 2005 by Mr. Carl Carmoni with the goal of bringing as many recreational players and fans of the sport into a competitive but friendly environment where everyone can hope to have a chance at winning. All players are separated into 3 classes (elite, amateur and beginner) based on their experience and past results. Before every team competition, teams are formed by a random draw where a beginner draws an elite for his partner and amateurs draw within their group with the objective to create balanced teams and have a level playing field. The newly formed teams then play 2 or 3 rounds depending on the number of entries. It is a best-ball format where lowest score of either team member is registered for each lane. The team with the lowest cumulative score is declared the winner. Those days serve as a warmup for the upcoming season. Scores were particularly high as iffy weather in the previous weeks made for very little practice opportunities and a lot of work was still required to adjust to the new surface. In the morning session, the team of Carl Carmoni / Eric Delisle finished first with a cumulative score of 59 after 2 rounds, 3 shots ahead of Ren� Labrie / Jonathan Fortin. The afternoon session was dominated by the team of Carl Carmoni / Ian O'meara who won by 5 shots with a cumulative score of 88 after 3 rounds over Suzanne Carmoni / Mathieu Paiement. The highlight of this first day was the double victory for Carl Carmoni and his 2 partners who was glad to confirm that all of his basement training during winter translated into a solid performance right from the start. Full results can be found here and here. The following week, 23 players showed up at Mini-Putt Saint-Hyacinthe on a sunny and warm spring Saturday, for another set of 2 preseason pro-am tournaments. A very strong field of elite players, with many titles and TV matches experience, joined the regular players. In the morning session, on the Maxi course (orange colour) the team of Alexis Bedard / Marc-Andr� Paquette finished first with a cumulative score of 50 after 2 rounds winning by 2 strokes over the teams of Suzanne Carmoni / Mathieu Labrie and Th�r�se Fournier / Patrick Lachance that tied for second place. In the afternoon session, on the Mini course (yellow colour) the team of Th�r�se Fournier / Patrick Lachance finished first with a cumulative score of 77 after 3 rounds winning by 1 shot over Daniel Letarte / Jean Montambeault. Pierre Pelletier / Pierrick L'Homme and Paul Boucher / Alexis Bedard finished 3rd, 3 shots behind. It is worth mentioning that Pierrick L'Homme & Jean Montambeault earned a purse in their 1st and 2nd ever tournament respectively. Carl Carmoni, the organizer and owner of Mini-Putt.net, was very happy that 5 new players showed up in Saint-Hyacinthe wishing that even more will do the same during the season and more importantly see those players again in upcoming tournaments. Next up is the first official tournament of the season which is scheduled for May 26 as we will be back at Mini-Putt Terrebonne for a morning pro-am followed by the individual competition where the 'Jean-Benoit' title will be at stakes. We shall see who made the most of the first day at that course and who will master the new carpets the best.